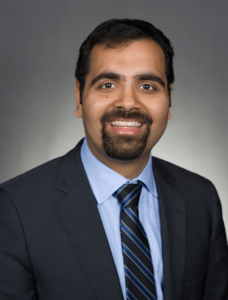 Aquifer congratulates Amit Pahwa, MD, Aquifer High Value Care Teaching and Learning Lead, on receiving the Louis N. Pangaro, MD Educational Program Development Award. This award, presented by the Clerkship Directors in Internal Medicine (CDIM) at their Annual Meeting, recognizes a CDIM member who has contributed to the development of an outstanding educational program. CDIM is a member organization of the Alliance for Academic Internal Medicine (AAIM). Dr. Amit K. Pahwa is receiving this award based on his extensive work advancing medical education on the topic of High Value Care (HVC), both at Johns Hopkins University and on a national scale. At Johns Hopkins, Dr. Pahwa serves as an Assistant Professor of Medicine and Pediatrics; Director, Internal Medicine Sub-internship; and Associate Director, Pediatrics Core Clerkship. In addition, he is a leader in high value care education serving as Co-Director of his department’s HVC Committee, and Physician Lead of the interprofessional, interdisciplinary Johns Hopkins Health System High Value Care Committee. This committee won the Society of Hospital Medicine’s 2018 Excellence in Teamwork in Quality Improvement Award, and Johns Hopkins’ 2017 Innovations in Clinical Care Award. Dr. Pahwa’s national work includes serving as an Executive Director on the High Value Practice Academic Alliance, which he worked to form in 2016 to create a national forum for academic institutions to collaborate on quality improvement, research, and education related to high value care. The alliance now includes more than 80 partner institutions in 18 different medical specialties, and hosts an annual national conference. At Aquifer, Dr. Pahwa is an integral part of the Aquifer High Value Care Course Board, serving as Teaching and Learning Lead and Associate Editor. All of us at Aquifer congratulate him on this important national honor.